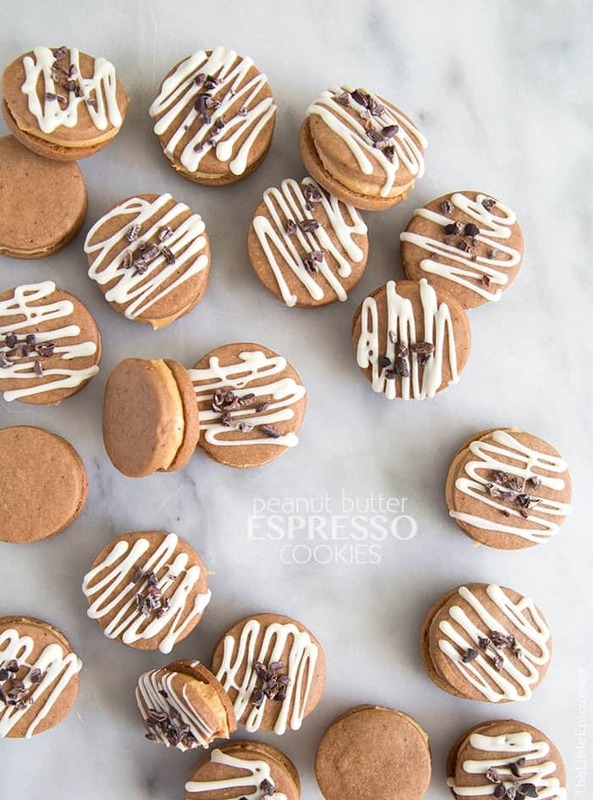 These peanut butter espresso cookies are made with a simple shored cookie dough infused with espresso powder and a touch of cocoa powder. To celebrate National Peanut Butter Month, Peanut Butter & Co. challenged the Yum Squad with a #MysteryIngredient project. Those who wanted to participate were given one of four mystery ingredients to showcase the versatility of peanut butter. Last week, you might have seen peanut butter and sriracha recipes floating around Pinterest. This week is all about peanut butter and espresso! Lucky for me, I am already a fan the peanut butter and espresso combination. Two years ago I made this “hyper monkey” smoothie. The smoothie was a mixture of espresso, chopped dark chocolate, milk, frozen banana and peanut butter. I absolutely loved it! While it may not have been the most nutritious of smoothies, it sure was delicious. I’ve been on a cookie craze these past couple of weeks thanks to the abundance of Girl Scouts in my neighborhood. Influenced by my current cookie addiction, I decided to make peanut butter espresso cookies! These cookies start with a simple shortbread cookie dough infused with espresso powder and a touch of cocoa powder. The recipe makes for about 2 1/2 dozen cookie sandwiches, meaning you’ll have enough to keep for yourself and plenty to share with others. Once you’ve baked the cookies, pair them together. I’m all about working quickly and efficiently. 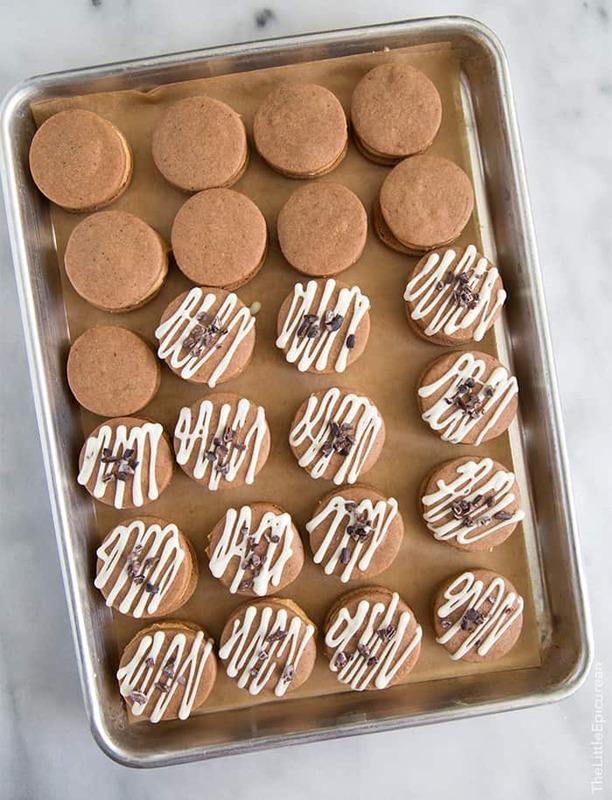 I find the best way to fill cookies/macarons/etc is by laying them out like the photo above. Place one cookie right side up and it’s paired cookie upside down. Filling all the upside down cookies and then use the remaining cookies to sandwich them together. It’s much faster than making cookie sandwiches one a time, filling as you go. These peanut butter espresso cookies could be done at this point… but, they look sorta naked to me. They need a little bit more. I melted some white chocolate and drizzled it over the tops of the cookie sandwiches. Before the chocolate set up, I sprinkled a little cacao nibs to emphasize the espresso flavors in shortbread cookie. Now these cookies are done and ready to be eaten! 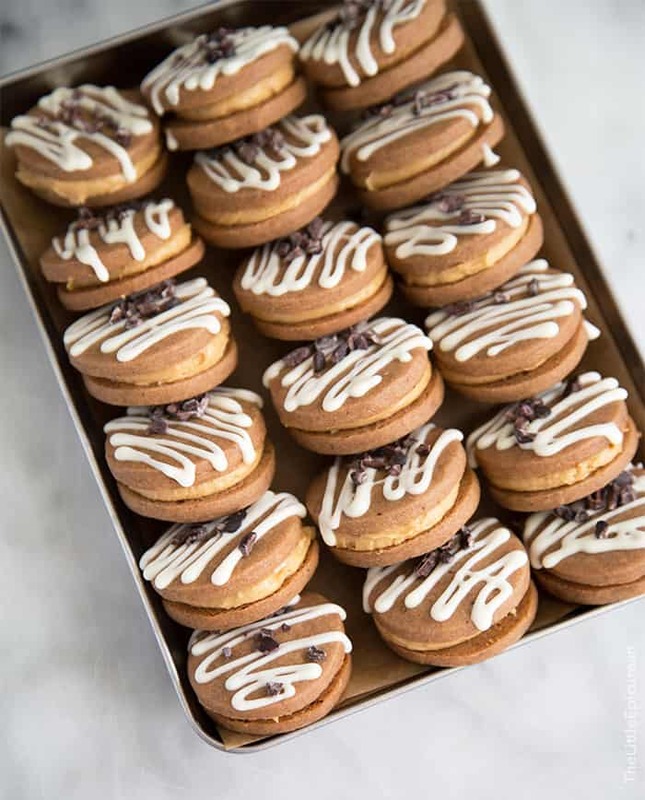 The espresso shortbread cookie is delicate yet full of espresso flavor, while the peanut butter filling is sweet and creamy. Together they make a wonderful pair that’s perfect with your morning glass of milk or afternoon cup of tea! Preheat oven to 350 degrees F. In the bowl of a stand mixer fitted with a paddle attachment, cream together butter and confectioners' sugar until smooth. In another bowl, whisk together espresso powder, cocoa powder, flour, and salt. Add flour dry mixture to creamed butter mixture. Mix until almost combined. Add vanilla and continue to mix until there are no longer any dry streaks of flour. Wrap dough in plastic wrap and let chill in the fridge for 30 minutes. Roll dough out on a lightly floured surface to a thickness of about 1/4-inch. Punch out rounds using a 1-1/2 inch circle cutter. Gather dough scrapes and press together. Roll to 1/4-inch thickness and continue to punch out additional rounds. Place rounds on a parchment lined baking sheet, spacing rounds about an inch apart. Bake for 15 minutes. Let cool in pan for 2-3 minutes before transferring to wire rack to cool completely. Peanut Butter Filling: In the bowl of a stand mixer fitted with a paddle attachment, cream together peanut butter and butter until combined. Add confectioners' sugar and salt. Mix until filling is smooth. 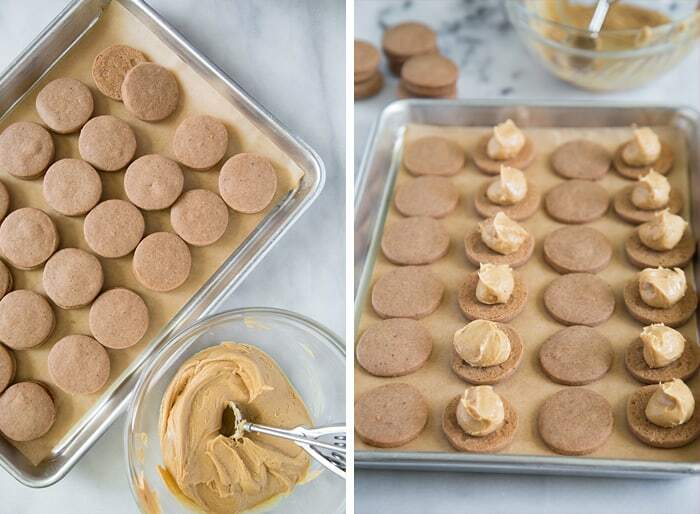 To assemble: Pair together espresso shortbread cookies. Place about 2 teaspoons of peanut butter filling on half of the cookies. Sandwich with remaining cookies. If desired, drizzle melted white chocolate over the tops of the cookie sandwiches and sprinkle with cacao nibs. Terms & Conditions: Comments are moderated and may not show up right away. One comment per person, please. Giveaway is only open to U.S. residents, 18 years or older at time of entry. Winner must be willing to provide a valid shipping address in order to receive prize. Comments close at 11:59pm (PST) on Wednesday, March 18. The winner will be chosen at random and notified by email Thursday (March 19). If the winner does not respond within 28 hours, winner forfeits prize and another winner will be chosen at random. Disclaimer: Giveaway prize is provided by Peanut Butter & Co. All opinions are my own. Baker, cake maker, and cocktail shaker. I believe in celebrating the every day. I like peanut butter and banana: 1 Tbsp peanut butter per bite of banana. These look so good! My favourite is Peanut butter and chocolate, duh! Nothung beats that! Favorite peanut butter combination would be cinnamon and honey or chocolate! 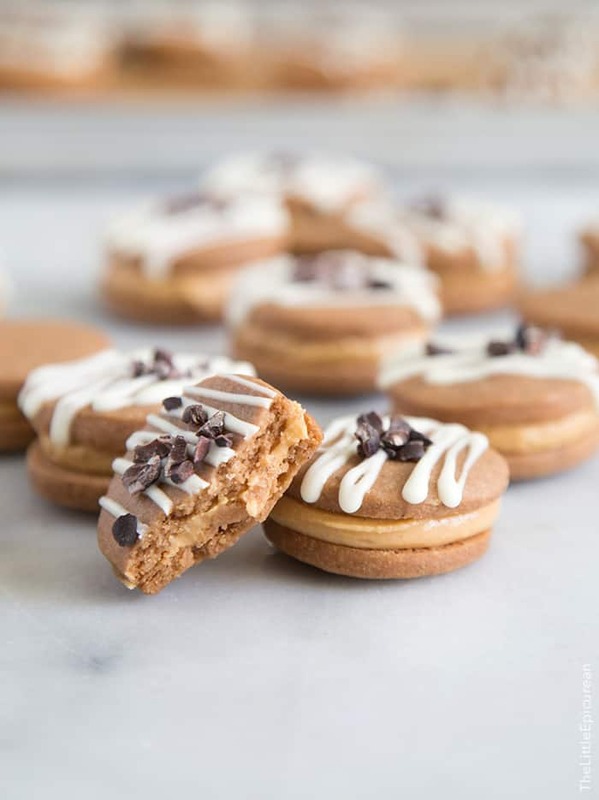 These peanut butter shortbread cookies look amazing! PB and chocolate (of course)!!! But next in line would be peanut butter & oatmeal. Peanut butter and chocolate or with banana and marshmallow and jelly. Peanut butter and coffee sounds like a great combo. These sandwich cookies are adorable! peanut butter and chocolate or banana! omg this is the perfect combination my husband and I would love. I should try this asap! I like peanut butter and bananas. Well of course, PB +Chocolate, perhaps some Banana too. These look so perfect! I can’t believe I gave up peanut butter for Lent! These are on my Easter Sunday list for sure. 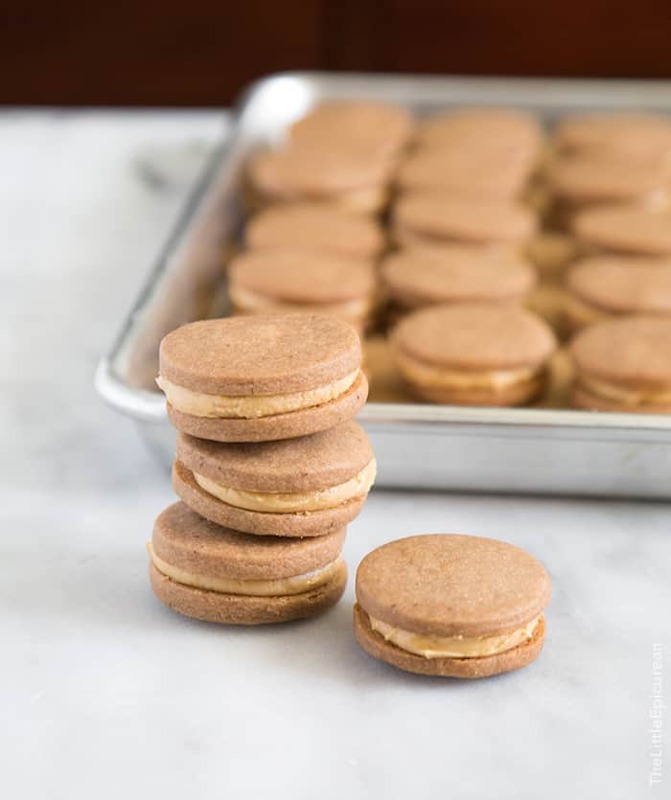 I love a sandwich cookie and the pairing of peanut butter and espresso sounds like such a great grown up combination to me! I like to make energy balls with peanut butter, oatmeal, and chocolate. This might sound weird to some people, but I really love peanut butter and fresh spinach on pita bread. It’s especially awesome with a drizzle of sriracha. It’s kind of like a thai peanut butter sandwich lol. My favorite combination is peanut butter and a spoon, but peanut butter and nutella in a crepe are a close second. Peanut butter and banana, a perfect combo. Pretty! These cookies are too cute to even eat! My favorite combination is peanut butter and milk chocolate. Peanut butter and marshmallow fluff. Totally have to try these, look awesome! Peanut butter and bananas are my fave! I love Peanut Butter and Banana, mashed with milk and honey and frozen to make ice cream pops! I love peanut butter, chocolate and marshmallow…. Peanut butter and Marshmallow is a great combo! PB and chocolate or PB and fig spread. My favorite combination is peanut butter and bananas. Absolutely peanut butter and chocolate! Peanut butter and chocolate is definitely my favorite. This recipe looks delicious btw. can’t wait to try it out! Peanut butter and chocolate are definitely my favorite combination! Love apples and peanut butter together! Only thing missing is the coconut! Peanut butter and chocolate. HANDS DOWN! Peanut butter and jelly donuts are really good. Peanut butter and chocolate wins in my book every time. Peanut butter and chocolate is my favorite! Peanut butter and milk chocolate is my favorite combination. Peanut Butter & Chocolate – nothing better! I love to put peanut butter in my oatmeal. And of course the classic pb + chocolate! Peanut butter chocolate chip cookies. I like peanut butter spread on a banana. It’s one of my favorite snacks. I’d love to try it with a flavored peanut butter like chocolate. Peanut butter and banana is my favorite combo! So comforting. Peanut butter & jelly sandwich on multigrain bread, GRILLED. Yum!